By LUDWIG VON KOOPA - Insidious race war creation. We're not for it. Which sea creature do you like more? At first glance, someone unfamiliar with Splatoon 2 may see that theme and think, “Well, so what?” They're just asking about sea creatures. You know, like the kind that you can go to visit an aquarium to see. In fact, it's more dangerous to the social order of Inkopolis Square than, say, the effect on the USA's social order after President Donald John Trump doubted his intelligence reports about Russian meddling in the 2016 presidential election. (Which was actually Koopa Kingdom's doing, not the Russian Federation's, thank-you-very-much.) This is because, as of a few weeks prior to this Splatfest, there have been a growing number of Octolings coming to Inkopolis Square — the apex of Inkling culture. Could Inklings and Octolings get along, despite their historical warring? As you can see in the video, there's an Inkling going in and out of squid form, coupled with an Octoling going in and out of octopus form. They're both screaming BOOYAH! upon successful completion of a Salmon Run shift, as is customary in Salmon Run etiquette. Clearly, Inklings and Octolings can get along in harmony, and Octolings can very much be assimilated into Inkling culture. Even the older generation sees great potential in the Inklings and Octolings getting along. The artwork behind Off the Hook's Pearl (Inkling) and Marina (Octoling) representing Team Squid and Team Octopus, respectively, are representations of an Inkling and an Octoling! Not of sea creatures! As a special rule for this Splatfest, Team Squid will be only composed of Inklings, and Team Octopus will only be composed of Octolings. 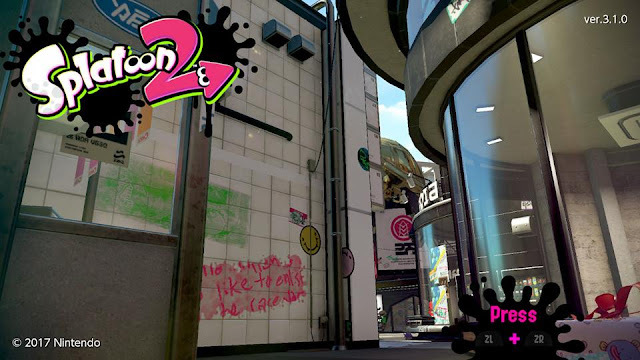 The symbols behind the Inkling/Octoling artwork are similar symbols used to represent Inklings and Octolings in a Turf War in the user interface. We have Octolings just recently integrating into Inkling society, and now all of a sudden, there is a Splatfest specifically designed to pit them against one another. Is this all in good spirit? No. Recall that, per Inkopolis law, the winner of a Splatfest is considered “legally better” than the loser. In other words, the two races are fighting for legally-recognised supremacy, in a zero-sum game where one party forever wins, and where one forever loses. The graffiti on the wall is partly illegible, but you can see it mentions something about enlisting in the race war. Let me make something very clear: KoopaTV is against race wars. We made an entire videogame about how race wars are bad. (It's called Trayvon Tyson's Punch-Out!!.) Race wars are senseless and stupid, based on something almost entirely immutable. (You don't WANT to go through the exception.) We think that the circumstances of one's birth are irrelevant. The Inklings and Octolings are smart enough to know this. They don't want this war. They want peace. It's being forced on them by a nefarious, other force, similar to how the Reverend Al Sharpton is stoking the race war in Trayvon Tyson's Punch-Out!! for his own gains. Who is this force? I don't actually know. Is it the humans seeking to turn the remnants of the squids and octopi into Squid and Octopus sushi? 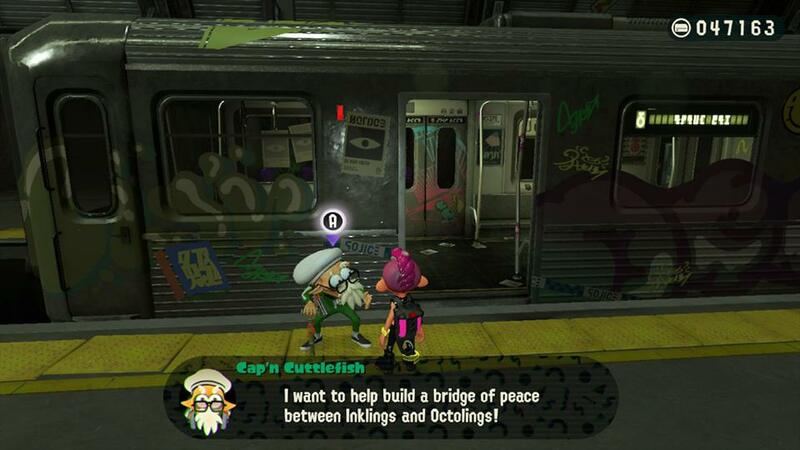 Cap'n Cuttlefish's bridge of peace between Inklings and Octolings will be a bridge to nowhere because of this dangerous Splatfest. If KoopaTV were to take a side in this race war, we would be partly responsible for stoking it. That goes against our ethics and values, and our sense of corporate social responsibility. On the other hand, it's also against KoopaTV ethos to not have an opinion on something. Despite my stated fondness for the Octopus theme from the Game & Watch Gallery games, and the fact that I like Octillery more than Malamar, I personally am on Team Squid. People who read my Splatfest articles know that I don't take factors like who is likely to win or the Off the Hook idol representing each team into account when I give an endorsement. I evaluate the teams based on how much I agree with their ideology. In this case, for the first time in Splatfest history, the simple act of selecting a team — either team — will put me on the wrong side of history, but if I start boycotting Splatfests, that opens the floodgates for an “out” option for future Splatfests that I consider intellectual laziness. So, I won't do it. But I won't tell YOU to go pick a side, either. I recommend you skip the Splatfest on the 21st of July at the end of this week. That goes for the whole world, since it's a global Splatfest. We need a bridge of peace. KoopaTV is traditionally not a peace-making organisation, so this is a rather uncomfortable role to play. That is why this article took some time. Ludwig prefers inconsequential stupid Splatfests (like the one listed below this footer) to Splatfests that can overturn the entire societal order like this one. The previous Splatfest was inconsequential and about an inferior fruit juice. This may be the most consequential Splatfest since Callie vs. Marie's. 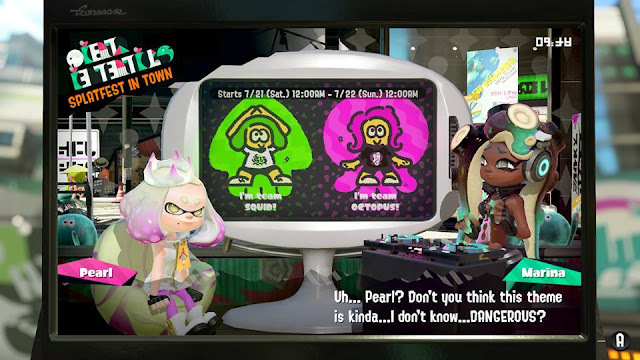 The next Splatfest is back on the silly side. Utensil battle! Ludwig still believes that society is better off with Inklings and Octolings working together. They thought that making it about the species they evolved from will prevent race wars but they are wrong. The Bible commentators say there is a reason all humans descend from Adam and Eve. "The Talmud likewise points out that one reason the entire human race descends from a single set of parents, Adam and Eve, is so that no one would be able to claim his ancestors are greater than his fellow's (Sanhedrin 37a). Judaism does not believe there is an inherently superior race of human beings." So having an ancestor species win over the other means that the current day species can consider themselves legally better because they came from a superior ancestor. Also Marina says that octopuses are extinct and Pearl says the Octolings are Inklings with unique hair. We know the extinct statement is false and is a reminder of how some human races and ethnic groups had pretended to be the dominant culture to escape persecution. 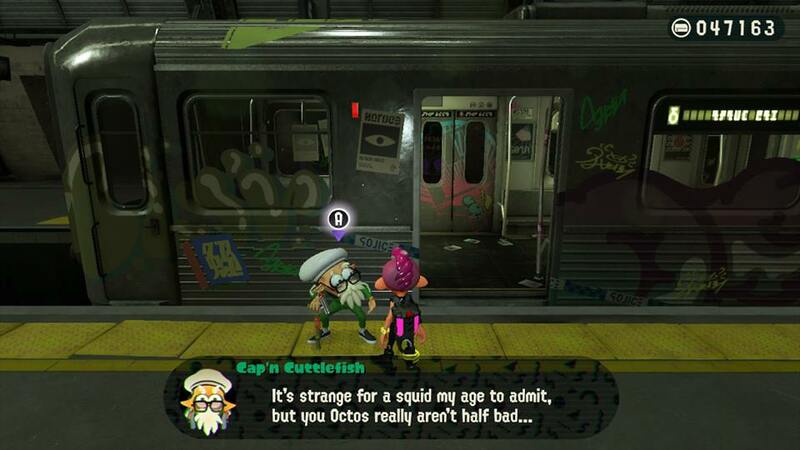 Basically Octolings are species-passing. Also there is evidence Pearl knows Marina is an Octoling disregarding Octo Expansion. She made Octopus jokes on air such as the eight tickles joke further not acknowledging Marina's species on air. On the contrary, I don't think they made any actual effort to try to prevent race wars. The real way to prevent race wars is to... not touch the subject at all. The slight problem with bringing up Jewish thought is that I praise Octoling assimilation into Inkling society, while Judaism is all about not having assimilation, and celebrating everyone's unique differences. There's a contradiction there I haven't worked out. "but if Marina is supposed to be a genius per the Octo Expansion, why is she such a bad Splatfest captain?" She is a genius with machinery and technology but that does not have to translate to being a genius at the social skills required to be a Splatfest captain. We all know about the genius who is bad socially stereotype. Well, it's less about social skills, and more about her total lack of argumentation ability, logic, and tactics. Machinery and technology should at least translate to some degree of possessing sufficient logical reasoning. "The slight problem with bringing up Jewish thought is that I praise Octoling assimilation into Inkling society, while Judaism is all about not having assimilation, and celebrating everyone's unique differences. There's a contradiction there I haven't worked out." "In one way, this was good news. The ghetto condemned them to being – as Max Weber put it – a “pariah people.” But in another, it was a momentous crisis. Until then, Jewish life had been a totality, infusing every aspect of existence with a distinctively Jewish flavour – dress, food, the Yiddish language, the Bet Din which resolved internal disputes, and the rich literatures, sacred and secular, which Jews had accumulated. Now they were being asked to fit their faith into essentially Protestant dimensions, a “religion” confined largely to private life. A measure of how radical a demand this was is the fact that before the nineteenth century there was no word for “Judaism.” There was Torah, there were Jews, and there was Jewish life. The question was: could Jews become Europeans in culture, while remaining Jews in faith and practice? Could they – as19th century Jews themselves put it – be “people in the street, and Jews at home”? Jews were meant to interact with the world at large but years of persecution made subgroups of them keep to themselves, even when they have no reason to restrict themselves. Some ban everything that will prevent them from interacting with the outside world such as no college, internet, etc, to prevent "corruption." I wanted to get the chance to read it all prior to replying to this (since I respect the former Chief Rabbi), so apologies for falling outside KoopaTV's usual 24-hour reply-back policy. Of course, I'm going to try not to put any connections between my support for THE (border) WALL at the United States with the idea that tall walls guarding a city make for a weak people. Brilliant citing of Hassidic thought in terms of interpreting the spies as having a fear of success. Now, here's where I can differentiate between the Octolings and the Jews: The Jews do have a greater purpose of existence, to engage with the world in the Jewish unique way. Secularism (assimilation) prevents that, ultimately for the detriment of the world. The Octolings do not have any higher aspirations. They just want to not be living in the crappy Octarian society. They're living just to live, not to have an impact. So them assimilating into Inkling society is fine with everyone. "When Octo Valley sends its people, they’re not sending their best. They’re not sending you. They’re not sending you. They’re sending Octarians that have lots of problems, and they’re bringing those problems with us. They’re bringing sea snails. They’re stealing Zapfish. They’re squidbaggers. And some, I assume, are good at Turf War." This article would be very different if I analogised the Octarians with illegals from Mexico or Middle Eastern refugees. But I don't, because they assimilate.